Sarah and Guy have created a child friendly environment for memorable family holidays in rural Brittany, a space for kids to be kids and for parents to relax, to unwind, to experience and remember how great time together can be. Look forward to some fun, family times on your holiday here. 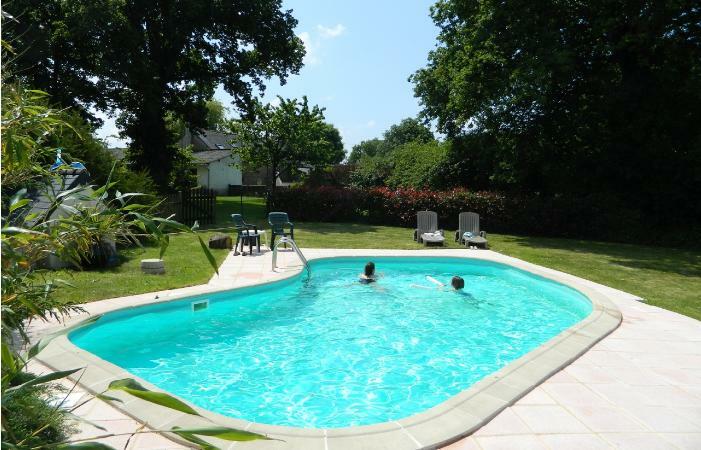 Relax in the French countryside, in traditional and comfortable child friendly gite accommodation, with family specific facilities, in ground heated swimming pool (by heat pump) and extensive childrens play areas. Look forward to making new friends, or come with exisiting ones! Le Noyer and Le Lierre are ideal for 2 families holidaying together. We are resident on-site, and take pride in our provision of clean and well maintained self-catering French holiday cottage accommodation. We are here if you need us, and will enjoy having a chat with you, without being intrusive. Ideally situated away from main roads and with village facilities close-by you can really feel that you have got away from it all, without going off the beaten track entirely! The market towns of Châteaubriant and Bain de Bretagne are just 15 kms away for all your shopping needs. Once you have met him you will not be able to resist!